Home / Sappi etc. / True or False? 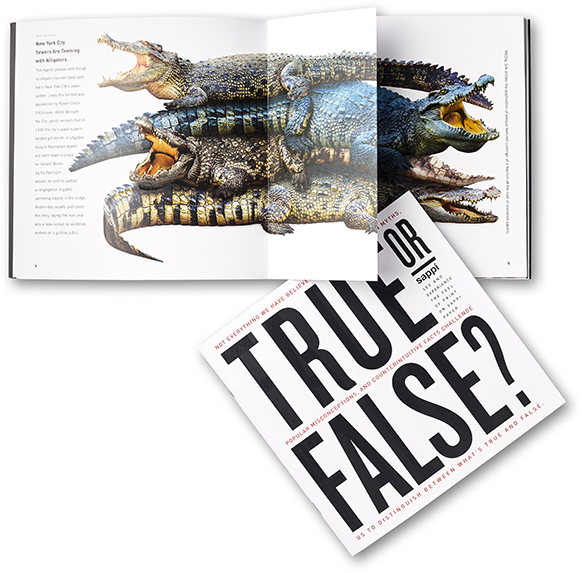 Filled with entertaining urban legends and popular misconceptions, Sappi’s new “True or False” booklet challenges frequently heard myths like “humans only use 10% of their brains” and “lightning never strikes the same place twice.” It also refutes the widespread belief that uncoated printing papers cost less than coated. 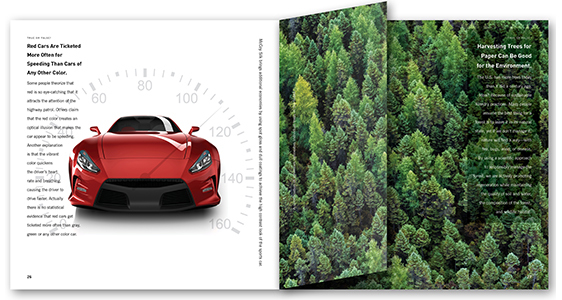 In addition to comparing costs, performance capabilities, and environmental benefits between coated and uncoated sheets, “True or False” presents an actual side-by-side demonstration of the same image printed with the same press settings on Sappi McCoy Matte and Silk and two comparable uncoated grades, so readers can see the tactile and visual differences for themselves. Misconceptions abound in the printing paper market. Some myths about coated and uncoated paper have been around so long that people accept them as fact, but not everything that people believe to be true is true. 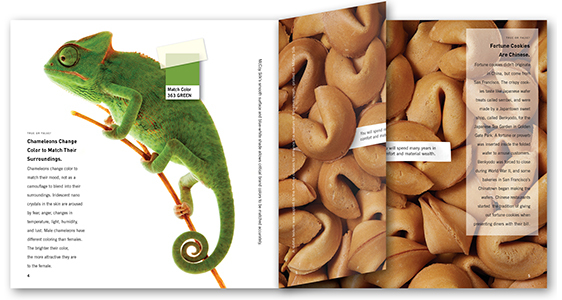 This spread presents the scientific findings behind why chameleons change color, and relate how fortune cookies were first created in San Francisco’s Japantown, not China. To bring out the chameleon’s bright iridescent nano crystals, the four-color process image was enhanced with a touchplate, reticulating varnish, and superimposed with a gloss coating. A textured varnish overprinted the fortune cookies to give them a “cookie” feel. Left: Statistics show that drivers of red cars do not get more speeding tickets, but they do attract attention from passersby. An extra red touchplate was added to this sports car to make it even more vibrant and eyecatching, with a raised gloss coating speedometer overprinting the car. Right: Making paper from tree fiber does not harm the forest when sustainable management practices are followed. If anything, well-managed forests reduce damage from fire, bug infestations, wind, and disease. To bring definition to the trees in this forest, the image was printed in four-color process with gloss and dull varnishes. Left: The hazard of eating eggs is more an exaggeration than a myth. For most people, the many health benefits far outweigh the risks. The delicate shades of these eggshells are enhanced with a match gray and textured varnish. 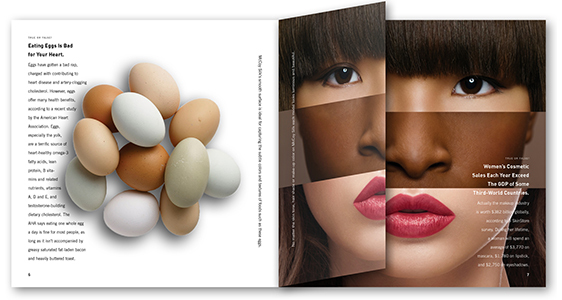 Right: Worldwide cosmetics represents a $382 billion annual market, and here a “split face” image was used to communicate a multi-ethnic appeal with different skin tones enhanced by textured, velvet and gloss varnishes, and a red touchplate.